SAME or NEXT DAY service - Fast repairs! - and a 2 hour time slot! 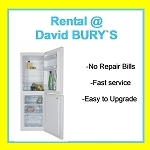 Fridge Freezer RENTAL - NO REPAIR BILLS, LOW PAYMENTS & EASY UPGRADES! First months rental (unless product is part of first month rental free offer) and £24.95 (£39.95 for electric cookers) delivery and admin fee payable in advance. Quality refurbished products minimum period of rental 12 months. Brand new products minimum period of rental 17 months. Subject to status, written details available on request. Terms and conditions apply see in store for full details. Actual product may vary from illustration, dependent on availability.